Brain research shows that engaging the senses helps students to make more connections in the brain and that increases long-term memory. These alphabet craft books will help engage more senses to help build mastery. This resource can be used with an alphabet interactive notebook or stand along as 26 alphabet shaped mini-books. This resource is upgraded to include two options. One includes a way to conserve on printing by having two letter flaps per a page (and it can still be no prep by letting students cut it out) and the other option is one letter flap per a page that allows you to have more choice with picking and choosing activities. I also added 26 no prep find the letter printables. Ultimately, the main makeover was to help you save time by adding no prep capabilities to it. No more cutting board! Did I mention each alphabet flap book only takes up half a page in a notebook? 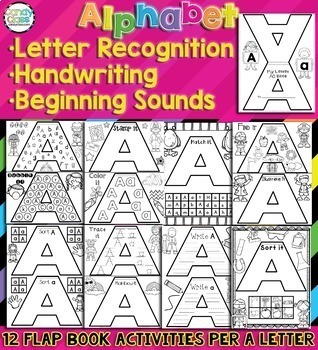 They are very tactile, engaging, and students will have their very own letter book for each alphabet letter that they can revisit and share with the class. Additionally, the Find the Letter is an additional activity that can be placed in the left side of the interactive alphabet notebook or used as a no prep printable. 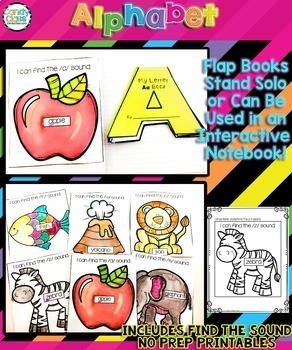 Create an alphabet interactive notebook or use them solo as flap books. 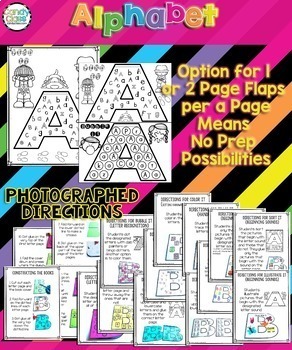 This alphabet interactive notebook bundle includes the following three resources, but are organized together by alphabet letter instead of three separate pdfs to make printing easier. You save 20% by buying the bundle! Plus, you get the bonus find the letter no prep activities that are exclusive to this bundle! Tip: You can always mix and match the alphabet activities as needed for each letter. There is plenty of alphabet activities to choose from in this resource to get your students mastering all aspects of the alphabet. Please note, I marked first grade on here because sometimes there are some students that need some extra intervention with the alphabet, and I hope and believe that this is going to help many students out there that are struggling to learn the alphabet. This resource for the alphabet is also good for students who are receiving RTI and for special education students too. 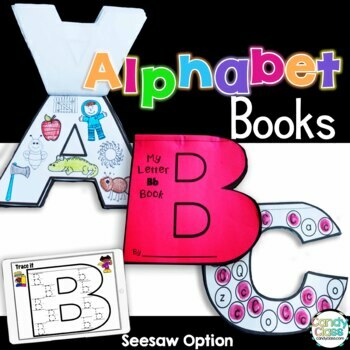 This interactive alphabet book or alphabet craft books are for personal use only. One license is for one teacher.